Do you have age spots that are driving you absolutely batty? No longer do you have to simply live helplessly with age spots, now you can DEAL with them once and for all. 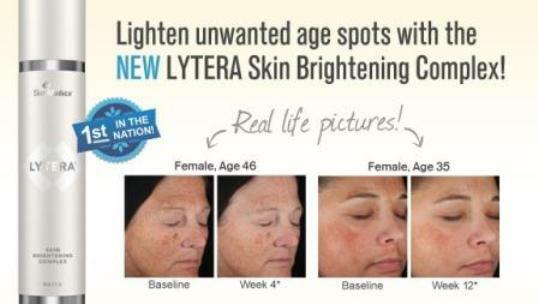 The LYTERA Skin Brightening Complex was developed by Dr. Joel Schlessinger (MD) and is rated first in the Nation! This product works to brightens dull skin and minimizes the appearance of skin discoloration and dark spots. Lyterra is appropriate for all skin types and users have seen improvements in as little as 4 weeks! This SkinMedica brand product retails for $169.40- stop in the salon today to pick up your bottle of Lyterra, or shop it here online.